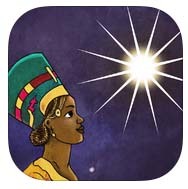 Three Wise Queens is an app of a whole different nature, which I had yet to review one like it. A storyline, it presents a perspective on a well-known scriptural event that is geared toward several audiences. Based on The Three Wise Men, this app brings into your home a beautifully designed story that follows the wives of each king, and focuses on their contributions and point of view during the events that led the strangers from distant lands to Jesus who laid in the manger. From following this complete story via an iPad app, I not only got my daily dose of experiencing more in the world of Christian technology, but I also was able to glean something very important. It was not just the kings who were led to Jesus: it was all of us through our spiritual connection in Christ that were brought to Him. And so this app was outstanding in that beneath the lines it was able to capture not only the female and child audiences, but brought with it a strong message of our brotherly and sisterly connection with one another in His birth. The graphics were outstanding and second to none. The audio was fitting and engaging. 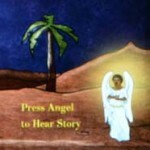 The story itself did not fall short of substantial content, and it was engaging at the same time as you could click on the image of an angel to have it read to you. The only technical drawback was that, being quite lengthy, I was looking for a link back to the start once I reached the end of the story but could not find one. I urge you all to try out this innovative take on a well known event in biblical history! Your child is sure to add this to their list of stories that, whether during the day or for bedtime, are going to want to hear it more than once. I rate this 5/5 crosses!